Turn left on South Side Square and stop across the street from Harrison Brothers Hardware Store, on your right at 124 South Side Square. 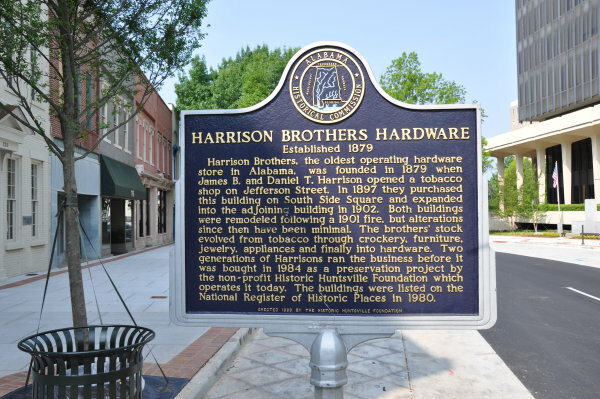 Harrison Brothers Hardware is Huntsville's oldest retail business. 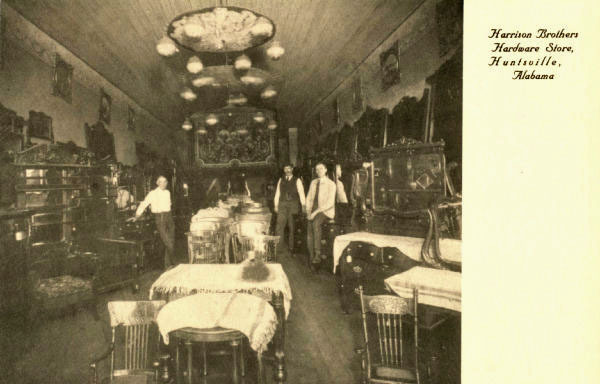 Brothers James, Daniel and Robert Harrison first opened a wholesale tobacco operation and they moved into this location in 1897, adding crockery, furniture and hardware. 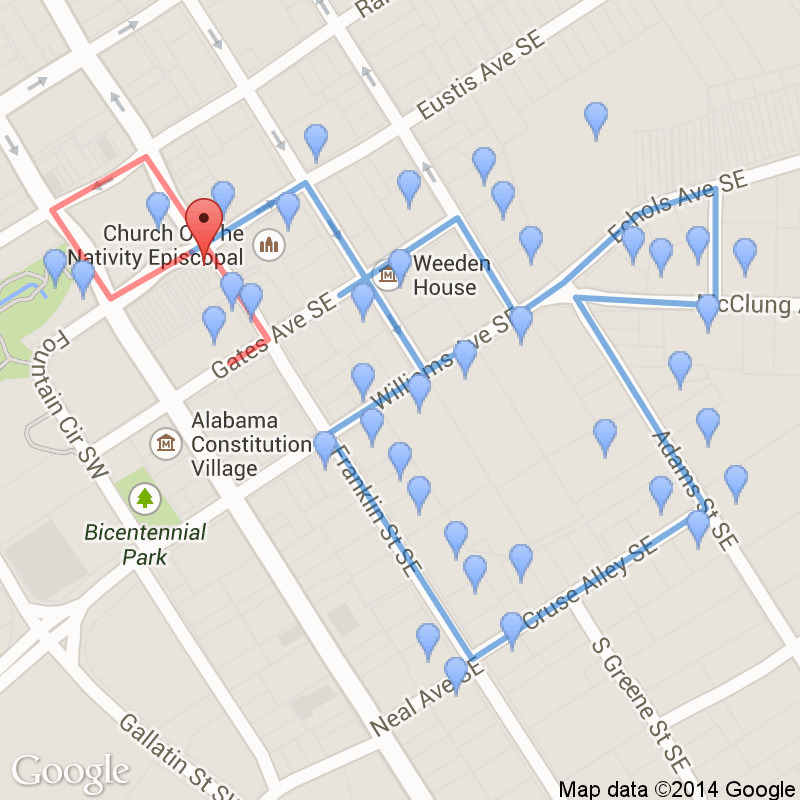 Robert's sons assumed ownership in the mid-1950s and carried on the family traditions. The store closed in 1983. The non-profit Historic Huntsville Foundation, started by architect Harvey Jones, bought the store, contents and all, and it reopened in 1984. Today the store is an eclectic mix of the old and new, town and country, all of it interesting, with a few surprises for the shopper hidden here and there. Harrison Brothers, the oldest operating hardware store In Alabama, was founded In 1879 when James B. and Daniel T. Harrison opened a tobacco shop on Jefferson Street In 1897 they purchased this building on South Side Square and expanded were remodeled following a 1901 fire, but alterations since then have been minimal. The brothers' stock evolved from tobacco through crockery, furniture, jewelry, appliances and finally into hardware. Two generations of Harrisons ran the business before it was bought in 1984 as a preservation project by the non-profit Historic Huntsville Foundation which operates it today. The buildings were listed on the National Register of Historic Places In 1980. 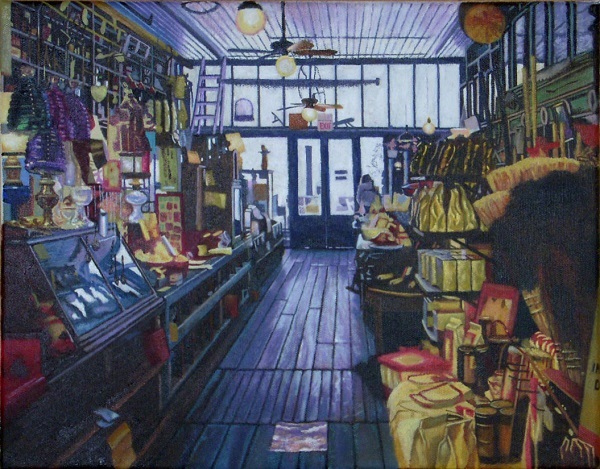 Jerry Brown's depiction of the Harrison Brother's Hardware interior. 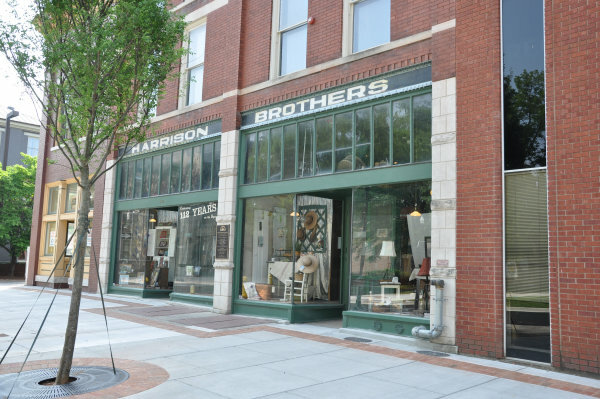 Located on the Courthouse Square since 1897, Harrison Brothers Hardware Store carries a varied line of Hardware, Crockery, Ironware, Chairs, Gifts, and hard-to-find items. The store is operated by the Historic Huntsville Foundation.